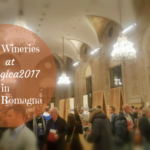 My idea for this article was to talk about some random wine tastings I did at the wine event #Backtothewine in Faenza last weekend. But imagine my surprise when I the other day while happily starting to write this article discovered that such a title was already taken for this event. Somebody else has my title…how could they…!  What will I do now…? Anyway, last Saturday I had a birthday dinner in Bologna and thought it could be a good idea to go to #Backtothewine in Faenza the day after. And I was so lucky that a friend was going there too and offered me a ride from Bologna. In the end, I was happy that I went as I like to discover new events and new wines even when my brain is a bit slow. And, even when it takes me all into the early afternoon to have the courage to actually start tasting some wine. Reading about the event on the #Backtothewine website, the first thing you notice is their manifesto. In the beginning, it felt like being in the middle of an attempt to a Futurist campaign or a political current. However, I can see that they want to express their idea of returning to a place where farming and the overall work of a winemaker is at the core. It was a very nice event with a lot of interesting wine producers exhibiting their wines. There were also stands with food and a corner for having lunch with different local farm-to-table products. It was all set up for the visitors to be able to enjoy their Sunday in the very best way. It was even possible to buy the products on the spot. For those who really wanted to splurge, they could get their own shopping cart. As I mentioned before, I did not taste that many wines but some few good ones. Two of the producers I already knew even though I had not tasted all of their wines yet. To be precise, one of them is a winery that has just re-started after being off the market for many years. Therefore, they just launched the first ‘new’ wines a couple of months ago. The other three wineries were new discoveries to me. Niccolò is very modest and he calls himself a winemaking apprentice, in that way showing that he made a change to his life but is still learning. I think we all are on a constant learning curve in whatever we do. 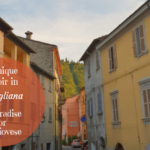 I had not tasted all his wines before because the Beatnik Orange Wine – Macerated Trebbiano is new and the Principio Chianti DOCG without added sulfites was finished last time. This time at #Backtothewine I was lucky. Beatnik Orange Wine 2017 is a 100% Trebbiano white wine where the Trebbiano grapes have been macerated on the skins for at least 10 days. The fermentation is done in cement vats and the wine is being neither clarified nor filtered. A fresh, mineral, and savoury white wine with notes of ripe and candied fruit. I like orange wines when they are good but I am not one of those fans who think there is nothing else than orange wine. Beatnik is a very enjoyable macerated wine. Principio Chianti DOCG 2017 is still a very young Sangiovese wine with a good acidity and biting tannins that, however, are not being overly intrusive. It is nicely fruit-driven (mainly cherry) and manages to give a sense of elegance and smoothness even though still so young. Just as it says in the name, no extra sulfites have been added. 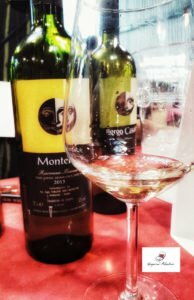 These two wineries are both in Emilia-Romagna and therefore I decided to talk about them together. Also, because they both make outstanding Albana white wines, among other wines. 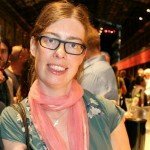 I did not really know much about these wineries beforehand, in reality, it was my tasting buddy who raved about them and recommended me to try them. I was, of course, not disappointed. 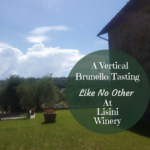 Vigne dei Boschi is located in Valpiana di Brisighella which is very close to the Tuscan border. 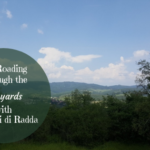 For those of you who might have read my article on the wines of Modigliana, you know the story of the areas along the Tosco-Romagnolo border. (See here) Vigne dei Boschi is an estate of about 35 hectares of which 6,5 hectares are vineyards. 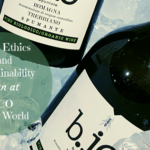 They are certified organic since 1994 and in 2002 they also started becoming biodynamic. I tasted their MonteRé IGT Ravenna Bianco 2015 that is a 100% Albana wine. The juice is fermented in French oak barrique and is then also matured in barrique. I am not always a huge fan of using oak on white wines but here it does indeed add structure and complexity without overpowering the grape variety. It is a fresh wine with a slightly smoky touch and lovely notes of ripe as well as candied fruit combined with a more green undertone. Cantina San Biagio Vecchio is a family winery situated just outside Faenza where they cultivate only indigenous grapes on 6 hectares of land. They are certified organic and apply only spontaneous fermentation in the wine cellar without any chemical additives. 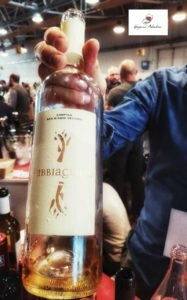 I tasted both the vintages 2017 and 2010 of their Albana wine SabbiaGialla IGT Ravenna Bianco. The name of the wine refers to the soil in the vineyard that contains patches or ‘bubbles’ of yellow sand from the Pleistocene era (the Ice Age) mixed with the clay soil. Regarding the vintages, they told me that 2017, which I already knew, was a very warm year while 2010 was a quite cold year. The differences are indeed perceivable in the wines. Both wines are just delightful expressions of the Albana grape. The 2017 is fresh, savoury, mineral with a mix of floral (such as elder) and ripe fruity notes (mainly peach and apricot). The 2010 still has a very good freshness, acidity and an explosion of aromas and taste. The fruit is more ripe and juicy and mixed in with the floral side, it has notes and a taste of candied fruit, a bit of honey, an almost caramelized touch and a light aftertaste of almond. This was the première so to say for Fattoria Bellosuardo and their wines. This is a winery in Castiglion Fibocchi, Tuscany, that has decided to take up winemaking again after many years away from this activity. 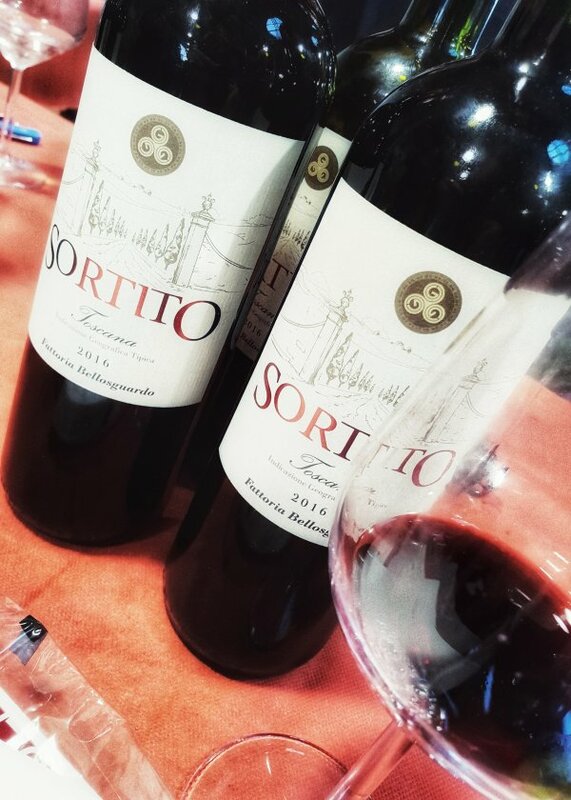 (See more in my article A Wine Venture in the Making Between Tuscany and Armenia) I wrote about them earlier in June when they launched the first of their wines – Sortito IGT Toscana 2016 – that I managed to taste now at #Backtothewine. This a fresh Sangiovese wine that has only matured in steel and it has clean, fruit-forward notes. The tannins are there but are non-intrusive. A classic, enjoyable Sangiovese wine. I also tasted their Posta Reale IGT Toscana 2016 that is a Sangiovese wine matured in barrique that still need quite a lot of time. The typical Sangiovese traits are there but the oak is still a bit too present covering the potential of this Sangiovese. Via the brand name Rikars Wine, they also produce wine in Armenia where they have vineyards and those wines also made their debut at #Backtothewine. They are cultivating the Areni Noir, a grape that was never touched by the phylloxera. 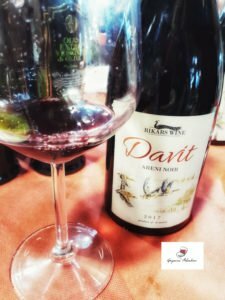 The two wines are Darit 2017 and Arag Amphora 2017. They are interesting wines with a certain body and notes of red fruit, spices, and a herby and more green touch. The wine matured in amphora had clean yet rich notes and taste. I am looking forward to having more time to taste them. Another discovery at #Backtothewine were the wines of Granja Farm. We just stopped by chance at their booth and first tasted their remarkably good apple juice. 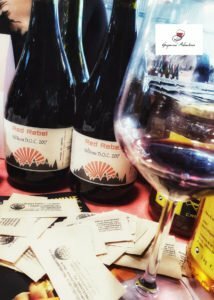 Granja Farm is a small farm and winery established in 2015 in the mountains of Alta Val di Susa in Piedmont. They have recuperated old vineyards with native grapes growing on terraces and on the rocks of the mountains. It is heroic viticulture at its fullest. 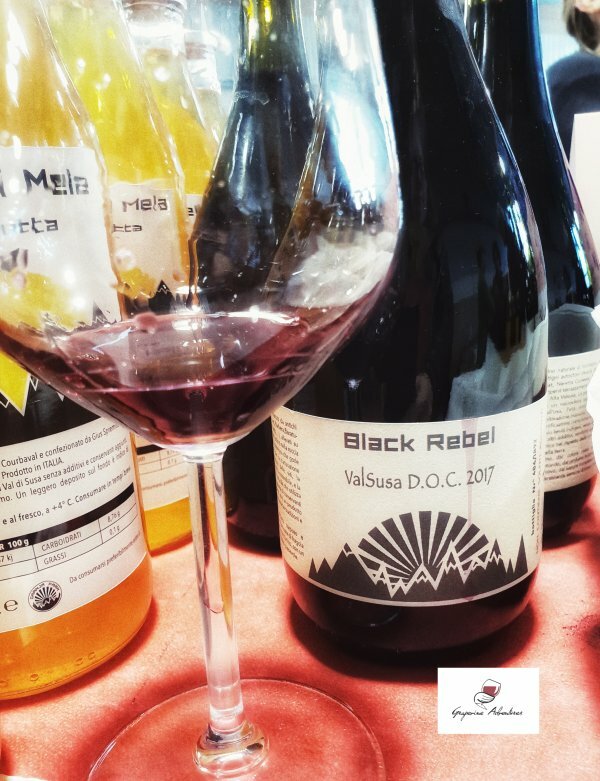 They produce two red wines, namely Red Rebel Val di Susa DOC and Black Rebel Val di Susa DOC. Red Rebel is a monovarietal Dolcetto wine while Black Rebel is a blend of several local native grapes such as Uvaggio di Avanà, Barbera, and Bichet. I very much liked both wines for their good acidity and freshness, the just lovely and rich fruitiness, red and darker fruit, both at the nose and palate. These wines are young but are yet smooth and a joy to sip on. 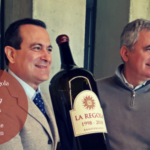 …tasting wines in good company, what could be better? 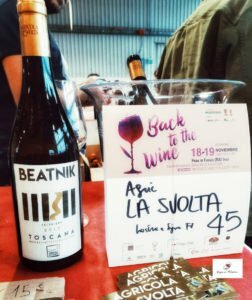 Back to the Wine was a relaxed and a not too crowded event where you could taste a variety of wines from smaller wine producers. The fact that there were also local producers of farm-to-table products and food stands was really helpful. That way, you could eat something in between the tastings without having to leave the hall in the search for a sandwich. An event well worth the visit on a Sunday afternoon.